terated its vehement opposition to proposals which would allow for- eign-flag vessels to transport com- modities such as timber and coal. Without question, the greatest threat to the Jones Act which emerged in 1988 was the purchase by Japanese entities of an American corporation with an inland barge line subsidiary. This purchase has caused an explosion of litigation, and regulatory and legislative activ- ities. If this precedent is allowed to stand, it would blow a huge hole in the Jones Act. Stating a complex case in simple terms, the Japanese owners of the inland barge line pro- pose to operate that barge line as a full U.S. citizen, permitted complete freedom to compete with U.S.- owned companies for commercial cargoes. Their reasoning is based upon their magical interpretation of an amendment to the Jones Act (the so-called Bowater Amendment) which permits narrow exceptions to the U.S. cabotage law, far more restrictive than the Japanese pro- pose. Bowater Amendment, and to dis- solve any ambiguity in the statute which might exist in order to keep the Jones Act impervious to these magical assaults. As long as the United States "Jones Act Trade" remains seduc- tive to foreign interests, we can expect all forms of imaginative at- tempts to breach it. AWO must and will counter these foreign forays with determination, skill and ener- gy, and with an objective eye to the changing world within which we ex- ist. The federal budget deficit, a problem of enormous scope and magnitude, has led tax administra- tors at all levels of government to create new and innovative ways to increase revenues. The tug and barge industry has been particularly hard hit. The states, to make up funds no longer provided by the fed- eral government, are becoming in- creasingly more aggressive in taxing waterway operators. In addition to navigation user taxes, we have been confronted with a wide array of state and federal fuel taxes and gen- eral corporate tax requirements. The tug and barge industry, in sim- ple terms, is in a blizzard of taxes. Committee. AWO will be closely monitoring deficit reduction pro- posals in all forums which could impact water carriers. Additionally, the AWO Board has directed the staff to pursue legislative relief from discriminatory state taxation. Such legislation would extend to water carriers the protections afforded to the rail, aviation and motor vehicle industries. Dena Wilson tors found themselves paying mil- lions of dollars in taxes they did not owe. The Act included a provision requiring all off-highway users of diesel fuel to pay, at time of pur- chase, 15.1 cents per gallon in high- way taxes and then apply for an interest-free refund of those taxes from the Internal Revenue Service. As a result, AWO generated one of the largest outcries of grassroots outrage and targeted media cover- age in its history. Although this upfront payment requirement ceased as of January 1, 1989, it proved to be a bureaucratic as well as economic nightmare. For Congress to suddenly require off-highway users of diesel fuel to pay taxes they do not owe is attrib- utable to the federal deficit. By hav- ing this tax collected upfront from all users of diesel fuel, the federal government was able to claim this windfall as income and count it toward deficit reduction. It was an unfair and inequitable way to force waterway operators and others to float an interest-free loan to the government. AWO worked hard to get the 1987 law changed. 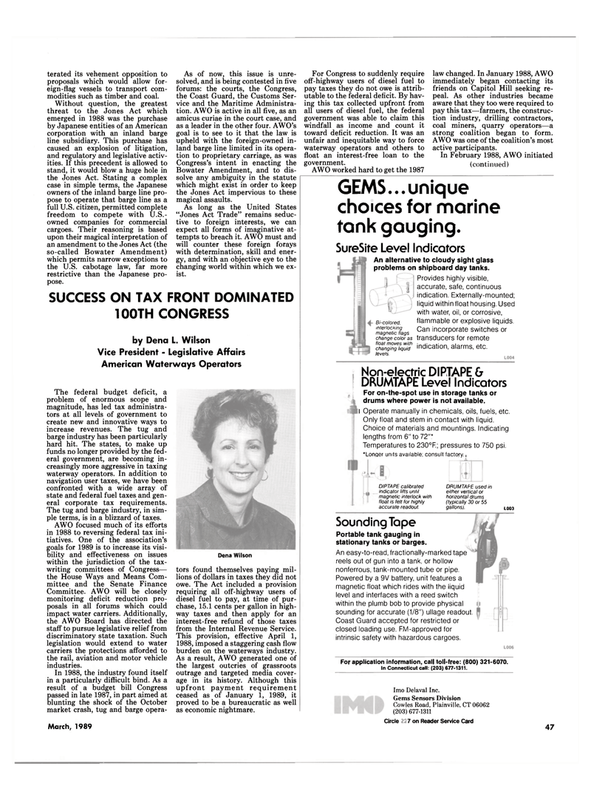 In January 1988, AWO immediately began contacting its friends on Capitol Hill seeking re- peal. As other industries became aware that they too were required to pay this tax—farmers, the construc- tion industry, drilling contractors, coal miners, quarry operators—a strong coalition began to form. AWO was one of the coalition's most active participants. GEMS... unique choices for marine tank gauging. I Operate manually in chemicals, oils, fuels, etc. Temperatures to 230°F. ; pressures to 750 psi. longer units available; consult factory..
DIPTAPE calibrated indicator lilts until magnetic interlock with float is felt for highly accurate readout. Powered by a 9V battery, unit features a magnetic float which rides with the liquid level and interfaces with a reed switch within the plumb bob to provide physical sounding for accurate (1/8") ullage readout. Coast Guard accepted for restricted or closed loading use. FM-approved for intrinsic safety with hazardous cargoes. In Connecticut call: (203) 677-1311. Bi-colored, interlocking magnetic flags change color as float moves with changing liquid levels. Provides highly visible, accurate, safe, continuous indication. Externally-mounted; liquid within float housing. Used with water, oil, or corrosive, flammable or explosive liquids. Can incorporate switches or transducers for remote indication, alarms, etc.